Rail reliability has improved by almost three times in the two years since he took over the Transport Ministry, said Mr Khaw Boon Wan, who wants to raise the bar even higher. Sharing preliminary data at the fourth joint forum on infrastructure maintenance organised by SMRT yesterday, he said that trains travelled 393,000km on average before encountering a delay of more than five minutes. This measure is known as mean km between failure (MKBF). 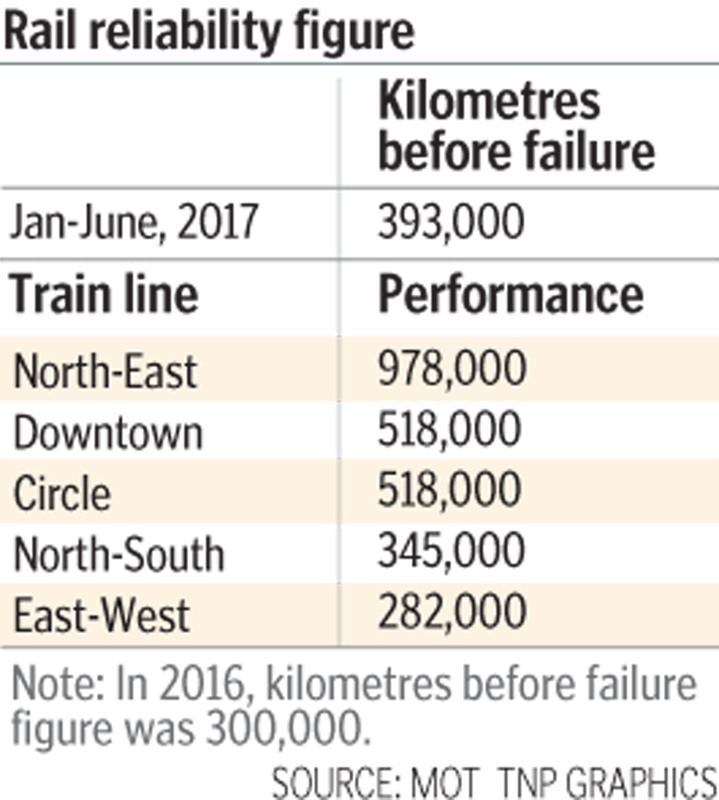 In 2015, before Mr Khaw moved to the ministry, trains travelled an average of 133,000km between delays of more than five minutes. Using best-in-class Taipei Metro as benchmark, he raised the ministry's 2020 reliability target from 800,000 to 1,000,000 train-km. Mr Khaw also noted the number of major breakdowns - those lasting more than 30 minutes - had fallen to three in the first half of the year, from 10 in the same period last year. He said the latest figures, based on preliminary data, exclude delays caused by testing of a new signalling system on the North-South Line because they happen "once in 30 years". The tests, which started on May 29, had caused several disruptions, including a two-hour delay on June 28. Mr Khaw said the London Underground and Taipei Metro had also warned of teething problems when a new signalling system is installed. He added: "While there will still be delays, if we have done our best to minimise them, I am sure Singaporeans will be understanding and forgiving." Mr Khaw chided the media for their coverage of the re-signalling project "because they have magnified the problem unfairly". In response, The Straits Times editor Warren Fernandez said: "We are aware of the complexities involved in the re-signalling process even as normal operations have to continue. "We have reported on that, but we also have to report on the difficulties that crop up along the way, and the impact they have on commuters facing disruptions." Mr Khaw's remarks on rail reliability improvements also drew many negative comments online. Transport experts told The New Paper the MKBF measurement is the most widely used to track rail performance but does not necessarily reflect commuter experience. Singapore Institute of Technology assistant professor Zhou Yi said: "Human factor and passenger satisfaction are more complicated than just engineering performance. "One disruption in peak hour would usually affect passenger experience much more than a delay in off-peak hours." Prof Zhou, who is deputy chairman of The Institution of Engineers' rail and transportation technical committee, said other countries also use benchmarks such as loss of passenger hours, or place higher penalties for delays during peak hours. Singapore University of Social Sciences lecturer Park Byung Joon, who specialises in urban transport, said: "MKBF doesn't really capture the difference between a five-minute disruption after 5km, or a one-hour disruption after 10,000km. "A short disruption on a large sector of the train line can also have a larger effect compared to a longer disruption on a smaller sector. "And it is also psychological. Commuters tend to remember the failures much more clearly."